It was the first presidential election since the Supreme Court struck down a key part of the Voting Rights Act, Clinton noted. This “made a difference in Wisconsin,” she said. Total voter registration declined in Georgia once this law was gone, she added. Some studies show that voter ID laws favored by Republicans have a deterrent effect, especially on minority voters, who tend to vote for Democrats. Wisconsin enacted a voter ID law before the 2016 election. A study from the University of Wisconsin found that the new requirements deterred thousands of eligible voters in two counties from casting ballots. Nevertheless, Clinton made several factual errors, offered questionable claims about a couple of studies, and ended up giving a misleading assessment of her loss. In 2013, the Supreme Court in a 5-to-4 decision struck down Section 5 of the Voting Rights Act. This section of the law was designed to safeguard minority voters’ rights in places where they historically had faced discrimination at the polls. The law required nine states and several counties to seek authorization from the federal government before making changes to their election procedures. Writing for the majority in Shelby County v. Holder, Chief Justice John G. Roberts Jr. said Section 5 was based on decades-old data that no longer applied. Wisconsin did enact a voter ID law under former governor Scott Walker (R). It requires voters to show a U.S. passport or a photo ID issued by Wisconsin state agencies, the military, Veterans Affairs, a university or college, or a federally recognized Indian tribe. Voter fraud cases are extremely rare in the United States. Experts say these voter ID laws are often attempts to tamp down the Democratic vote. Did this Wisconsin law prevent 40,000 to 80,000 voters in the state from casting ballots in 2016? We asked Clinton spokesman Nick Merrill to weigh in, and he pointed to several studies. For the low end (40,000), Clinton was relying on a 2017 study led by Kenneth R. Mayer, a political scientist at the University of Wisconsin at Madison. So, the “deterred” pool includes those who mentioned the voter ID law as a reason for sitting out the election. But those in the “prevented” pool mentioned it as the main reason. Both pools include voters who said they didn’t have a qualifying ID under Wisconsin’s law. Mayer and DeCrescenzo estimated anywhere from 5,250 to 14,101 “prevented” voters. Here’s where things start to get hairy. Mother Jones interviewed Mayer about the study and paraphrased him making just such an extrapolation. The study’s lead author, University of Wisconsin political scientist Kenneth Mayer, says between roughly 9,000 and 23,000 registered voters in the reliably Democratic counties were deterred from voting by the ID law. Extrapolating statewide, he says the data suggests as many as 45,000 voters sat out the election, though he cautioned that it was difficult to produce an estimate from just two counties. “We have hard evidence there were tens of thousands of people who were unable to vote because of the voter ID law,” Mayer told me. 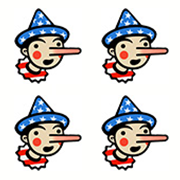 The Mother Jones article may have given Clinton a mistaken impression, but we always warn politicians: You are responsible for the claims you make, so double check the facts. We also told Merrill what Mayer said and didn’t get a response. Merrill cited a May 2017 memo by Priorities USA, a Democratic super PAC. But, as we previously noted in this Three Pinocchio fact-check, correlation isn’t always causation, and this study does not offer evidence of causation. Rick Hasen, an elections expert at the University of California at Irvine, noted that black voters in Milwaukee, which experienced a dramatic decline in turnout in 2016, were not motivated by Clinton the same way they were for President Barack Obama in 2008 or 2012. Moreover, there was a general decline in the black vote in 2016, compared with 2008 or 2012, both in states that had voter ID laws and states that did not. All that aside, how did 200,000 become 80,000? "The claim is ludicrous because Wisconsin was not a state covered by the part of the Voting Rights Act, which the Supreme Court killed in the Shelby County case. So even if it had been in effect it wouldn’t have stopped implementation of Wisconsin voter ID, as it had stopped Texas’s voter ID. "The numbers of people who were turned away from the polls is likely much lower than Clinton says. The most reputable study, which I think still overstates things, is the one by Ken Mayer at U. Wisconsin. But there is reason to be very cautious about trying to attribute the presence or absence of voter ID to turnout. A recent NBER study found no effect whatsoever. Other studies, aside from Mayer and DeCrescenzo’s, indicate that voter ID laws do have an effect on turnout. A 2014 study by the Government Accountability Office analyzed Kansas and Tennessee and concluded that their voter ID laws decreased turnout for the 2012 elections. The Supreme Court’s ruling in 2013 had no bearing on Wisconsin. The University of Wisconsin study she relied on for her 40,000 estimate says its findings from two counties should not be extrapolated to form statewide conclusions. Her spokesman did not cite any study for the 80,000 estimate. Voter registration in Georgia did not decline from 2012 to 2016. Wrong on multiple levels, seriously misleading and worth a cumulative Four Pinocchios. in a speech in Selma, Ala.